Yes, it is true. We had no where to go on Christmas Day since most of the shopping malls, supermarkets, restaurants and fast food chains were closed on the festive season. 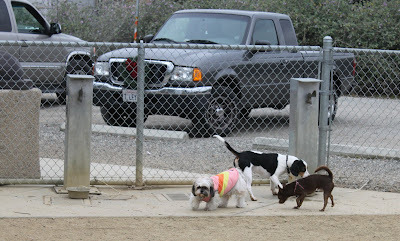 Thus, we decided to spend our Christmas with Baby and Max at the dog park. 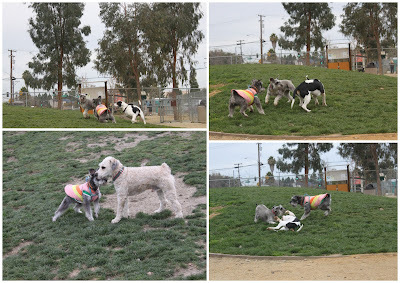 After spending much time searching on the internet, we managed to find the nearest dog park which took us about 15 minutes drive (about 7 miles from our home). It is known as Reed Street Dog Park. 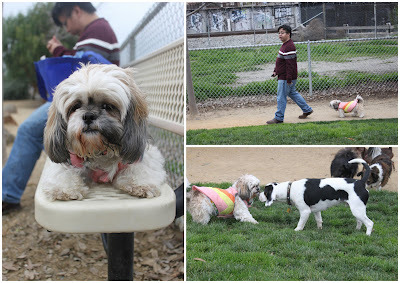 This was our first time to the dog park so we brought along the basic necessity for the dogs such as a water bottle and some "poo poo" bags in case for the emergency purpose. When we reached there, we were surprised to see the cleanliness of the park which was fully equipped with water in the bowls and "poo poo" bags for the dogs. In order to keep the park, all the dog owners have to be responsible for their dogs. The owners have to pick up and throw the poo poo bags in the bins. 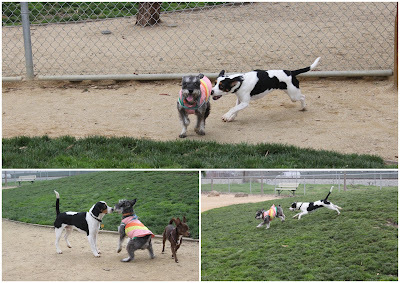 Max (in an orange jacket) had a great fun after being chased by his friend. This time, they were playing police and thief ... don't you think so? Our pampered princess, Baby prefers to stay with mummy and daddy. As usual, she doesn't like socializing with dogs but prefers to play with cats, squirrels or insects.. Weird .